Peripheral neuropathies are common in older people. Although the ageing process itself may play a part, there are multiple other causes. Peripheral neuropathy interferes with normal daily activities and leads to increased risk of falls, injury and poor quality of life. Management of peripheral neuropathy ofen needs a multidisciplinary team approach. Peripheral neuropathy can be classifed by the pattern of nerve involvement, time course, type of defcit or nature of the underlying pathology.8 (Box 1) The patterns of nerve involvement that occur include mononeuropathy, multiple mononeuropathy (mononeuritis multiplex), symmetrical polyneuropathy, radiculopathy and polyradiculoneuropathy. Mononeuropathy refers to involvement of major nerve trunks, singly or multiply. Radiculopathy refers to involvement of nerve roots, again singly or multiply. Polyneuropathy affects terminal branches of multiple nerves, often involving both legs and arms and occurring bilaterally (symmetrical polyneuropathy).9 Distal symmetrical polyneuropathy is the most common variety of polyneuropathy.10 Te time course can be acute (reaching maximal deficit in less than four weeks eg. Guillain-Barré syndrome), subacute (reaching maximal defcit in 4–8 weeks) or chronic (taking more than eight weeks to develop). Te resulting defcits may be purely or predominantly sensory (eg. diabetic distal symmetrical polyneuropathy ) , pure l y motor (eg. acute motor axonal neuropathy), mixed motor and sensory (eg. Charcot-Marie-Tooth disease) and autonomic. Te responsible pathology may be axonal, demyelinating or mixed axonal and demyelinating. Peripheral neuropathies of all groups may involve large nerve fbres, small nerve fbre or both. Large nerve fibres are long, myelinated and enable fast conduction of impulses. They can afect motor function and the sensory modalities of vibration, position sense and temperature. Small fbres may or may not be myelinated. Each type involves different sensations. Involvement of small fbres commonly produces pain and paresthesiae (often described as burning, lancinating or “ice pick in the bone”). Small fibre neuropathy is the most common type of neuropathy in people over the age of 50 years and typically affects the lower limbs. It often precedes the development of large fibre neuropathy. This type of neuropathy is ofen unrecognised by physicians and responds poorly or slowly to medication.9 Although large and small nerve fibres may be affected together, only large fibre involvement can be detected by conventional nerve conduction studies. Nerve damage due to inflammation or compression tends to sustain a more or less complete recovery because of the ability of Schwann cells to proliferate and remyelinate demyelinated axons. 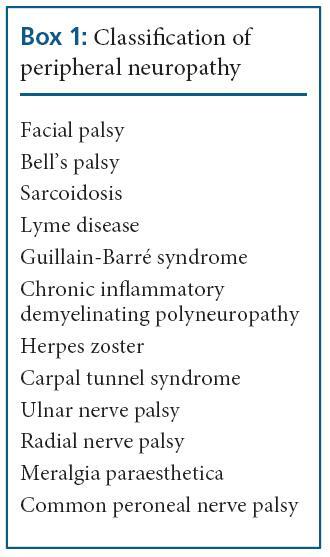 Causes of symmetrical polyneuropathy are more extensive and complicated than those of mononeuropathy, although relatively few diagnoses account for a large number of cases (eg. diabetes mellitus, alcohol over use). An accurate history and clinical examination remains vital in the clinical evaluation of a patient with peripheral neuropathy. The history should address symptoms, possible causes and time course. It is important to note the time period that has taken for symptoms to evolve and progress. Sensory nerve involvement commonly causes a sensation of wearing an invisible glove or sock, burning or freezing pain in the extremities, numbness, tingling, pins and needles, bandlike sensation around the wrist or ankles and unsteadiness and stumbling. Motor symptoms are usually those of wasting and weakness. Te symptoms will depend upon the muscle groups affected and whether those involved are distal or proximal, but include difculty in turning keys in locks, unfastening buttons and removing the tops of bottles and jars, foot drop, difculty climbing stairs, getting out of chairs and standing from crouching. Patients may also have cramps and spasms. Autonomic symptoms depend upon the system involved. Cardiac involvement may give rise to heart rate irregularities, orthostatic hypotension and dizziness on standing. Gastro-intestinal involvement can commonly cause nausea, vomiting, constipation and diarrhoea. Genito-urinary involvement results in poor bladder control and sexual dysfunction. Autonomic symptoms can be very disabling. In searching for probable causative factors, enquiry should routinely address recent infections, alcohol and drug intake, diet, family history and symptoms of systemic disease. Motor signs include muscle wasting and weakness, which in symmetrical polyneuropathy is usually distal and symmetrical. Occasionally fasciculation may occur, particularly in radiculopathy. Sensory loss is also predominantly distal, often in a glove and stocking distribution. Sensory testing should include light touch, pinprick, vibration and joint position. Distal tendon refexes are commonly absent. The patient should be observed standing and walking, rising onto their heels and toes, the Romberg’s test and walking heel to toe. The skin should be examined for trophic skin changes and ulcers in the extremities. Bony deformities such as pes cavus and clawtoes may be present. Nerves should be palpated for thickening. Examination of the optic fundus may reveal papilloedema in chronic inflammatory demyelinating polyneuropathy and the retinal abnormalities of diabetes mellitus. Basic laboratory investigations that should be performed on all patients with peripheral neuropathy of undetermined aetiology include urinalysis, haemoglobin, white cell count, platelets, erythrocyte sedimentation rate, fasting blood glucose, serum electrolytes, serum proteins, vitamin B12, TSH, auto antibodies, serum protein electrophoresis and immunoelectrophoresis, serum creatinine, liver function tests, chest radiographs and electrophysiological studies. If these investigations do not provide information that leads to a diagnosis, special investigations may be required, such as cryoglobulins, HIV, anti Myelin- Associated Glycoprotein (MAG) antibodies, urinary heavy metals and Lyme serology. Nerve conduction studies play a vital role in confirming the presence of peripheral neuropathy and establishing its cause. Tey help to determine whether a patient has a mononeuropathy, mononeuritis multiplex or a generalised neuropathy; whether the neuropathy is symmetrical or asymmetrical; whether both sensory and motor fibres are affected; and whether the underlying pathology is of axonal degeneration or demyelination. Motor conduction velocities below 40m/s in the upper limb and 30m/s in the lower limb indicate possible demyelination. Lesser degrees of slowing of nerve conduction velocity indicate peripheral nerve damage, which could be due to axonal loss as in axonal neuropathy or neuronopathy (pathology within the nerve cell body). Electromyography is ofen useful in confirming the presence of axonal degeneration. However, denervation potentials may not appear until three weeks afer the onset of axonal degeneration. Cerebrospinal fluid (CSF) examination is sometimes useful in the investigation of peripheral neuropathy. For example, in Guillain-Barré syndrome, CSF protein concentration rises in the frst week. In chronic infammatory demyelinating polyneuropathy, oligoclonal IgG bands may be present. An increase in white cell count may be seen in HIV and Lyme disease. Quantitative sensory testing, autonomic function studies, molecular genetics and nerve biopsy (eg. sural) are some of the targeted investigations. However, these are not routinely done and may need referral to a specialised unit for further assessment. Management of polyneuropathy depends on the underlying cause and its clinical presentations and implications. Identifcation of the cause of the peripheral neuropathy often leads to useful treatment even if it is only the removal of the causative agent (eg. stopping alcohol) or treatment of the underlying condition (eg. 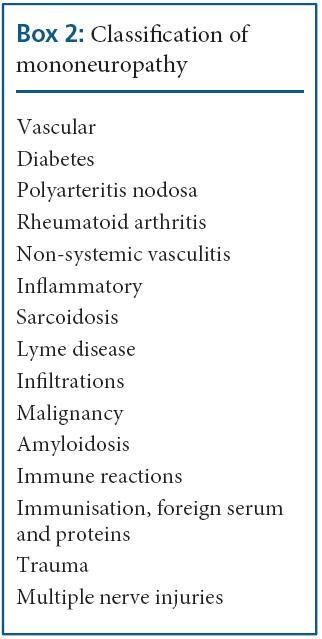 diabetes, B12 defciency, HIV, Lyme disease).8 It is important to identify the impact of peripheral neuropathy on a patient’s wellbeing. Aspects commonly missed in evaluation and management include anxiety and depression, breakdown of social relationships and activities of daily life, sleep disturbances, inability to engage in recreational activities and negative feelings of self-worth. O c c u p a t i o n a l a n d physiotherapy, as well as psychosocial support, may reduce the impact of these factors. Preservation of physical functions and maintenance of quality of life should be a priority in the management of peripheral neuropathy. Neuropathic pain due to small fbre neuropathy tends not to respond well to treatment.12 However, some benefit may be obtained by the use of drugs, such as tricyclic anti-depressants (eg. amitriptyline, dosulepin); antiepileptics (eg. sodium valproate, carbamazepine), selective serotonin reuptake inhibitors (SSRI), narcotic analgesics (eg. opiates) and topical agents (eg. capsaicin, lidocaine patches). Nerve blocks and local anaesthetics may be used as a last resort to alleviate otherwise intractable pain. The older person is more likely to succumb to peripheral neuropathy related to diabetes, paraproteinaemia-associated malignancies and chronic inflammatory neuropathies (eg. chronic inflammatory demyelinating polyneuropathy). Chronic inflammatory demyelinating polyneuropathy is the commonest acquired cause of chronic demyelinating neuropathy and typically causes symmetrical weakness and sensory changes in the limbs, developing over a period of more than eight weeks. It is important to distinguish chronic inflammatory demyelinating polyneuropathy from chronic axonal neuropathy, because the former, unlike the latter, responds well to treatment. Te diagnosis is suggested by a history of a relapsing course, examination findings of proximal or distal weakness, and CSF findings of increased CSF protein with normal cell count.8 Confrmation of the diagnosis depends on neurophysiological studies showing slowing of nerve conduction. Corticosteriods, intravenous immunoglobulin (IVIg) and plasma exchange have all been found to be benefcial in treatment. However, sometimes, in pure motor chronic inflammatory demyelinating polyneuropathy, symptoms worsen on corticosteroids so IVIg should be the frst line of treatment. The usual regime for treatment of chronic infammatory demyelinating polyneuropathy with IVIg is infusion repeated every four weeks until maximum response is achieved. If the response to corticosteriods, IVIg and/or plasma exchange is poor, cytotoxic drugs can be used. At present, azathioprine is the commonest such drug in use in this situation. Monoclonal gammopathy is a common disorder, especially in older age. A small percentage of these patients will develop overt multiple myeloma.16 Paraproteins may be associated with axonal neuropathy, amyloid light (AL) chain amyloid neuropathy and demyelinating neuropathy.8 Monoclonal gammopathy of undetermined significance (MGUS), solitary myeloma or plasmacytoma and POEMS (polyneuropathy, organomegaly, endocrinopathy, M protein band on electrophoresis, skin hyperpigmentation) syndrome can be associated with demyelinating neuropathy.8 Te clinical picture is usually of a very slowly progressive sensory or sensory and motor demyelinating neuropathy. Ofen there is a postural tremor. The pathophysiology seems to be one of sharing the same epitope of IgM MGUS and antibodies to Myelin- Associated Glycoprotein (MAG) and other myelin proteins and glycolipids. Testing for anti-MAG antibodies is widely available. Te nerve conduction studies show a prolonged distal motor latency. Te need for treatment in these neuropathies is debatable because they progress only very slowly. If necessary, cytotoxic drugs, such as chlorambucil, can be used. Peripheral neuropathies commonly affect older people. Peripheral neuropathy can be caused by axonal damage or demyelination, as well as damage to large or small fbres. The risk of falls and disabling symptoms like pain are quite pronounced in the elderly, leading to poor quality of life. Diabetes and heavy alcohol use commonly cause symmetrical axonal polyneuropathies. Neurophysiological studies are helpful in distinguishing axonal from demyelinating neuropathies. However, in the presence of small fbre neuropathy, these tests ofen are not useful. Usually, there are no specific treatments available. A multidisciplinary approach with pain relief, physiotherapy, management of anxiety and depression are important in managing these patients.